Porcelain toilets rarely call for any sort of cutting. Typically, the tile around the toilet or the bolts that secure it call for the blade. If you do need to cut through a porcelain john -- whether it be for creative repurposing or making selective notches or trims -- the versatile angle grinder will serve you well. Practice making cuts on scrap porcelain before tackling the unwieldy shape of a toilet. Thick porcelain poses a cutting challenge. Move the toilet to a sturdy work bench if making major cuts. 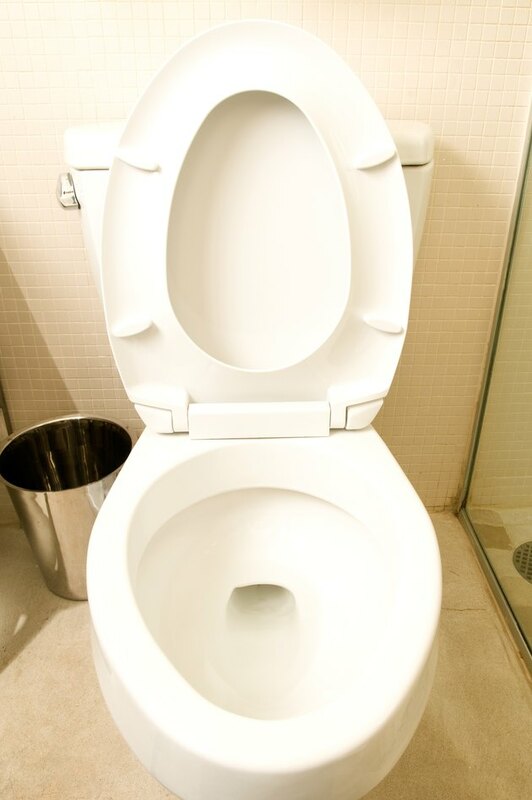 Enlist a partner to help, as porcelain toilets typically weigh in excess of 50 pounds and are an awkward shape. Secure the toilet to the bench with tie-down straps such as ratchet straps or bungee cords. Place the toilet at about waist height, if possible. Mark an outline on the toilet of the cut you'd like to make. Put on work goggles, heavy-duty gloves and a face mask to protect yourself from flying debris. Equip the angle grinder with a diamond cutting disc. Grip the angle grinder firmly, with one hand on the side handle and one on the main handle. Line up the edge of the diamond disc with the mark you made on the toilet. Allow the disc to reach its full rotating speed before contacting the surface of the porcelain. Score the cut you plan on making by following your marked line with the blade of the grinder. Don't press too hard -- let the weight of the tool do the work. Make the score about 1/8 inch deep. Apply a few drops of cutting oil to the score. Follow the score with the grinder's cutting disc to complete the cut. Keep pressure at a minimum, working your way through the porcelain slowly. Power down the grinder, allow the disc to stop spinning and unplug the tool every 10 minutes to allow it to cool and to relax your hands. Resume cutting when the disc is cool to the touch and your hands are rested. Apply cutting oil to the cut in progress before returning to work. Finish deep cuts with a hacksaw equipped with a diamond blade. Lay the blade in the cut you've made with the grinder and make long, slow back-and-forth strokes using a medium amount of pressure. Use cutting oil to ease blade wear-and-tear and help alleviate the strain of this lengthy process.